Download the demo version of the Outlook PST file repair software in order to fix the corrupted PST file on any of the latest version of Outlook such as Outlook 2010, 2013, 2016 with utmost ease. It is recommended to opt for the demo version prior to the purchase of licensed version. The Preview option enables every user to view the Outlook attributes with complete ease. Outlook 2010 is the new version of Microsoft Outlook. Outlook 2010 has more advanced features compared to other previous versions like quick access to commonly used options, better storage capacity etc. This version of Outlook supports connections to multiple mailboxes across different organizations, which is useful for administrators, consultants who need access to multiple email systems at different times. It provides better conversation management i.e. it has a new feature for combining and collapsing conversations so that they do not clutter the inbox and the message sequence does not get scattered among other inbox items. But this version, like another version can fall prey to PST file corruption. If the PST file gets corrupted then you lose access to notes, calendar, contacts etc. In such cases, you need a PST recovery tool to repair your file. For instance, if the PST file gets corrupted due to CRC error you stand to lose access to the information stored in the file. In such situations, you need a PST repair tool to fix PST file CRC error. 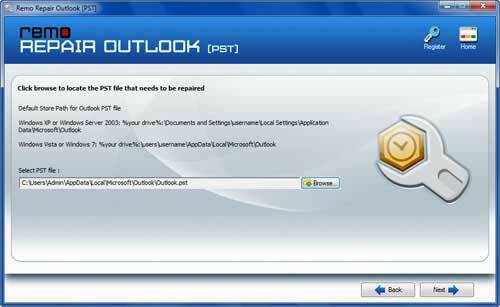 This tool is equipped with advanced features to repair outlook archive PST file. Network Device Failure: Faults in a network device may often lead to PST file corruption. A PST file resides on the network server and can be accessed from a client computer through network links. If the network cables, cards, routers, hubs and any other devices constituting the network links have problems then the PST file may get corrupted. Header Corruption: When you try to open a PST file, the operating system first reads the header of the file to know more about the information contained in it. If the header gets corrupted then it is not possible to decode this information thus leading to file damage. Oversize: If the size of the PST file exceeds the fixed normal limit then the file gets corrupted. A PST repair tool is designed to fix PST file corruption due to above-mentioned scenarios as well as other scenarios. 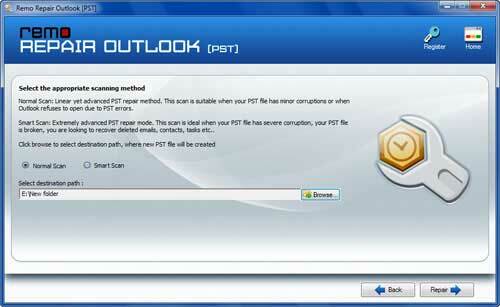 The PST repair utility is bundled with attractive features that make PST file recovery easy and effective. With this tool, a user can recover Outlook attributes like inbox, calendar, notes, tasks, journals etc. 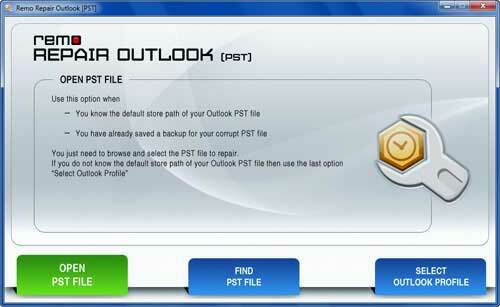 This application can repair PST files created on all Outlook versions. It also repairs OST files. Highly encrypted and password protected PST files can also be repaired with this application. This software provides a preview option that enables you to have real-time preview of the repaired items in the outlook style browser view. The recovered data is stored in a new PST file to ensure greater security of data. The PST file shows abnormal behavior if the size exceeds the fixed limit. For instance, Outlook 2000 PST files get corrupted if the size exceeds 2GB. This application has powerful features to successfully repair PST file bigger than 2GB. Step 1: Download and install the PST recovery tool. Select either “Open PST File” or “Find PST File” or “Select Outlook Profile” based on requirement. Step 2: "Browse" and select the required corrupted PST file and click “Next”. Step 3: Choose “Normal scan” to scan PST file. If the PST file is severely damaged then you can use the “Smart scan” option which scoops out the files which lie too deep. Click "Repair" option to initiate the repairing process. Step 4: Soon after the scan process is over, a window with the count of emails, tasks, journals, contacts, calendar gets displayed.